Morphy Deformation Rig Beta (maya 2009 version)! When you open the scene, go ahead and play the timeline. You'll see some quick deformation poses I set so you can get an idea of how things move. 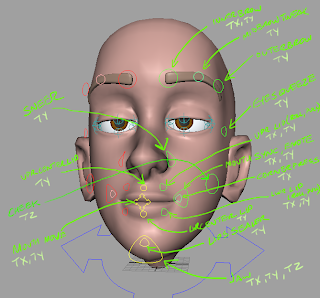 There are a series of controls surrounding the face that are being animated. The eyebrows are simply connected via a wrap deformer (please note the polycount on them is quite low). I'm planning on using the same for other customization stuff as well but and open to ideas if you have them. 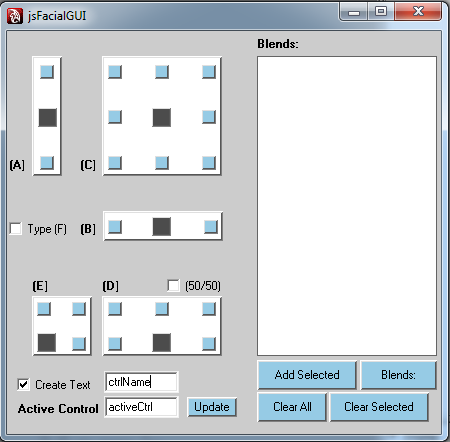 There's a quick select set called "qssFaceCustomize" that as all of facial deformation controls in it. I use zooTools set manager to work with Quick select sets and find it to be a very quick workflow. "d" is my hot key and I bring up the menu if I hold it and select my last set if I just hit it once. Feel free to delete my poses or just add your own after them and see what you can come up with. Start moving them around, scaling them whatever. That SculptMe blendShape is for you to sculpt on without having to add it to the blendshape node though you can feel free to add your own as well on that front.You'll be able to see them if you turn on the layer "MorphTargets"
If you want to play with asymmetric facial deformation, open up the expressions editor and comment out or delete my FaceCustomizerExpr and you can just grab those right side joints yourself and break the face to your heart's content. Are there enough deformation controls for you? If you'd like more, where would you like them. Would you like some sort of interface to drive the morphs in the customization phase? Are you happy with only deforming one side of the face and having it mirror across or would your prefer asymmetric deformation ability? 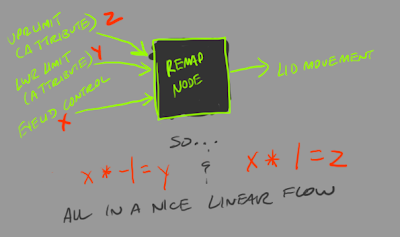 Do you want to have the morphability when you are animating or would you like a "freeze look" function that pulls out unnecessary nodes and what not for speed's sake? Please email feedback to me (see contact page) with a subject line of "Making Morphy Moldable". The final morphy rig will more than likely be limited on the the morphability side for free with a very low cost "honor system" fee for the full blown rig. I'm not 100% on that yet but am leaning that way as a way of justifying continued character making efforts (which I happen to enjoy quite a bit but doesn't exactly pay the bills). So...anyone providing an asset that makes the cut on rig inclusion will 1) get early access to the final rig, 2) get a credit in the release docs as well as the morphy page on my website with a link to your website and 3) not have to pay anything to get it as my way of saying thanks for taking the time to help this endeavor. What am I looking for? Customization stuff - Now that you have the base head, you have the basis to make beards, mustaches, hair dos, new eyebrows, glasses, new ears, earrings, monocles or whatever you can think of. Submissions should be sent to me (see contact page for email addy, don't forget to remove spaces) and a subject line of "Mophy shall be mine!" Can't all you verts just get along? So lesson learned here. At some point when I was sculpting Morphy at the end there I lost symmetry and in doing so made getting my blendshape targets symmetrical nigh to impossible. So I spent most of yesterday restoring symmetry to the base mesh and all the subsequent morph targets. Good times. Current count of morphs is 33 without and left right splitting on the main targets. Most of my facial rigs in the past have been bone based so I'm a bit new to the blendshaped facial workflow. 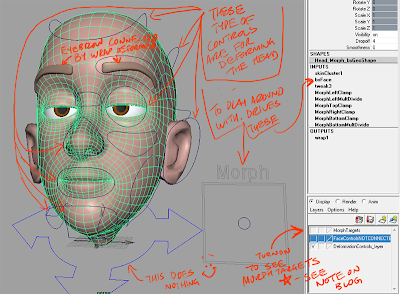 So new rule is: "When creating a blendshape based facial rig, before beginning to make your final morph targets, CHECK symmetry." Silo - why maya doesn't have a calculate and restore symmetry function is beyond me. If it does and I don't know where it is. Don't hesitate to point out my maya modeling newbish self and laugh (preferably as you tell me where that tool might be). Now I'm SURE there are better ways to do this but here's what worked. Make head fixed for symmetry. Hook up all asymmetrical blendshapes to original asymmetrical head (baseHead). 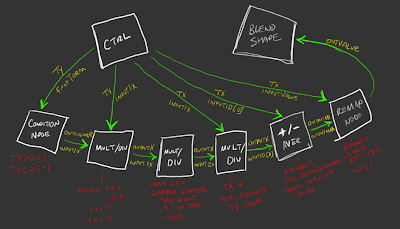 Manually duplicate the baseHead as you turn on the blendshape channels one by one (while leaving the symmetry head channel on). Save all of these new exported shapes into a new scene. Go look in the mirror and say to yourself, "Don't do this again." Have a nice Saturday all. 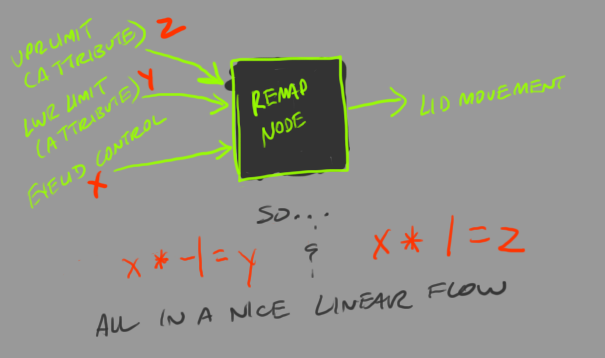 That's a bit of a mess and a major pain to edit for the user and wanting to follow in Shleifer's Animator Friendly rigging principles I looked into a bit of a more elegant solution and learned to love remap nodes in the process. So with a bid of elbow grease and heavily modifying Doublestein's eyelid joint setup by adding new attributes and some new doodads everything connects in one nice little script. It's also pretty cool in that there's now attributes sitting on a control that you can mess with to tweak the range of the lid movement by the controls. Pretty nifty. Now I'd really like to buckle down and learn some python but if I'm gonna finish Morphy anytime soon, it'll have to wait. 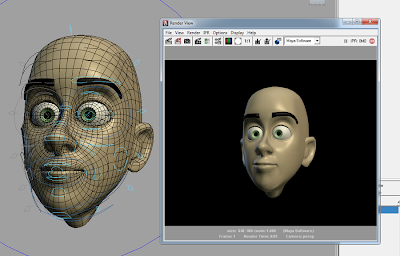 Beta Eye Rig is Maya 2009 safe! Found a pretty easy way of getting my weights over when I was playing with some different joint orientations for the eyelid control stuff. It was especially easy since the face was UV'd. That being said, here is a more compatible version of the beta eye rig for Morphy. 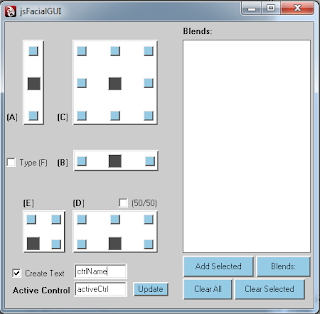 I also added a rotation control on the middle eyelid movers for even more flexibility. Also wanted to mention what I neglected to earlier. I'm using my good friend Scott Engert's eye setup and John Doublestein's eyelid method (with some extra stuff on it). I updated his (awesome) script to be able to account for multiple eyelid joints and if anyone wants that I'll ping him and see if he minds. Time for bed. Tomorrow I'm moving back to the rest of the face while I wait for some feedback on this. Looking for a few good animators (with Maya 2011 preferably)....apparently the new maya has a completely new skinning paradigm that blows up in old versions of maya (though everything else works). I'm afraid I don't have time to reskin it for the test in an older version though I shall be doing Morphy's final skin in an older version if I can't find a work around for that. So, down to business. Control positions and feel - I've been planning on doing the whole rig being "on face" as is apparent in the quick test on the whole face last week. Specifically the FK eye control position - try it where it is, then select it, pickwalk up once to it's transform group and snap that to the locator in front of the eye to try it there. 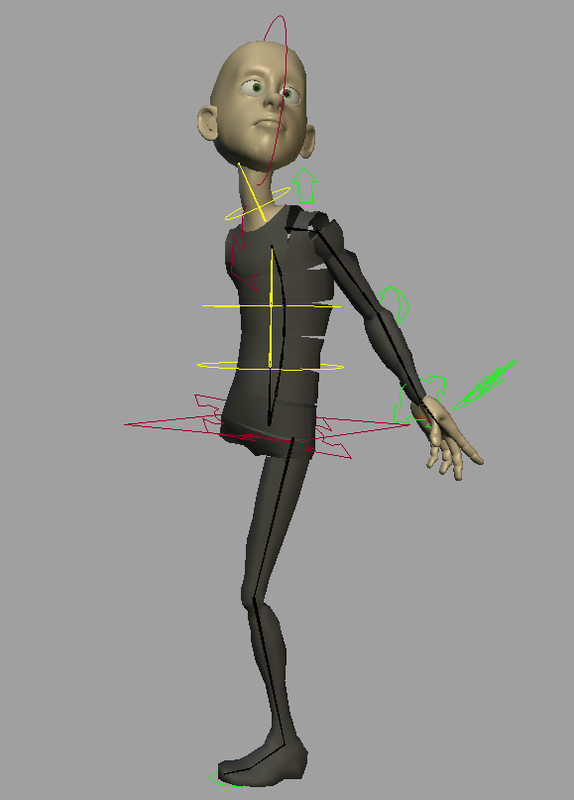 Does anyone actually know a good way to get maya 2011 skin open in an older version of maya? If it's an issue I probably need to shift development to an older version. Please email me your feedback with the subject line of "Morphy has his eyes on you"
If you have an older version of maya, you can open it fine back to 2008, just delete the skin or hide it. To my few readers who check often enough, thanks ahead of time if you can take a look. To my mom who reads this as well, I'm afraid you probably can't help on this one though if you wanted to make me some fried okra next time I'm home we'll call it even. Found some time to update the ole' reel. Added some Psyop work, the latest Garden City work and cut a couple of things on the last one. Getting Morphy done can't come too soon. I needs me some more lip sync on there. So sad that I have SO MUCH lip sync footage from Midway that's just facial animation only and thus worthless for a full body keyframe reel. Morphy is coming along fine. Got his eye and lid rig working for the most part. Gonna post another post in a bit to try and get some beta testing on the eye rig. ...And it's not at all visible at any point in this post. So you'll have to trust me on that one. After that, the same cycle continues till the end only now I've added facial customization control animation on top of it. 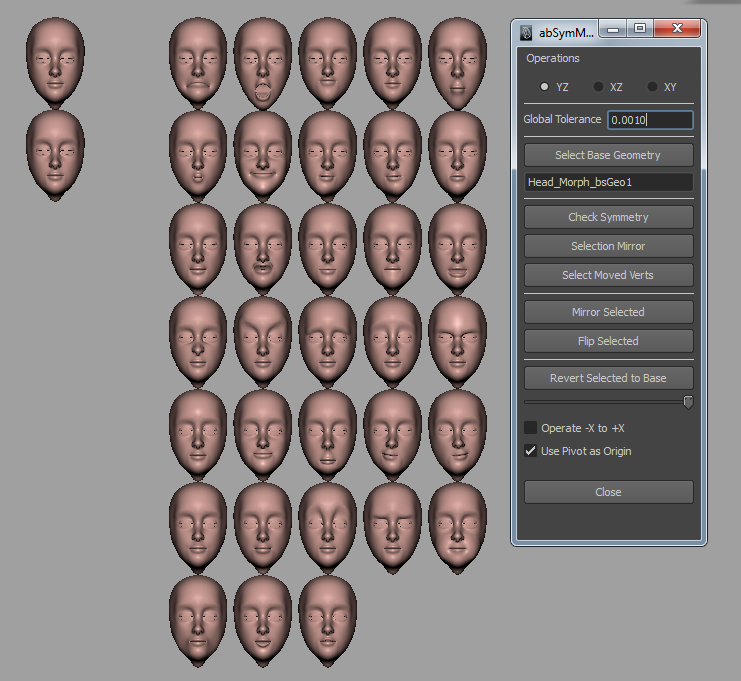 All three heads are exactly the same rig, only I've toggled some visibility to make things clear. 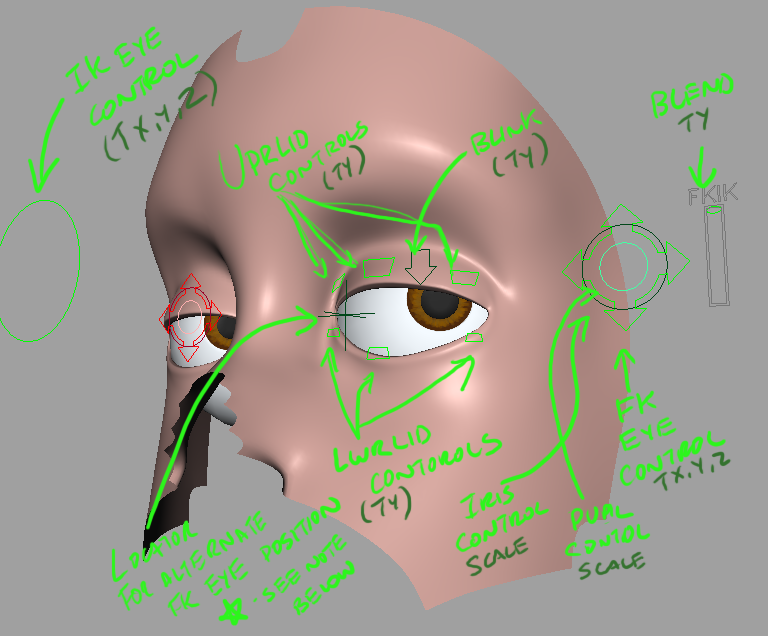 The blue controls on the left are facial deformation controls that you can use to scale and move different parts of the face. The green and yellow controls are regular animation controls that you'd use when doing facial. The right side will be the same as the green ones, only mirrored and red. Man, some of this stuff is taking a while to get working the way I want. Getting the jaw's movement to scale with the mouth shrinking was especially contentious. Eye rig - this is gonna be a bit tricky as well because I'm moving the eye around but I think I have a good plan of attack on that. 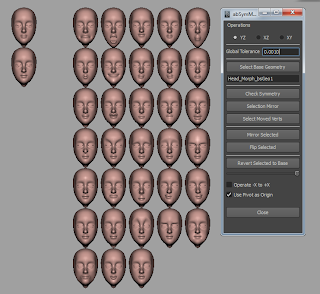 Polishing poses for the facial rig and then creating the left/right variants. The funky little anomolies in the range of motion are the breakdowns (upr/lwr lip variations). Now to the good stuff. So I posted a test a few days back where I was looking at what morph only based deformation could do for facial variation. I know that can work but wanted to have better flexibility and control for the end user that would be funner than just grabbing sliders. So today I decided to experiment with a joint based inital facial deformation system that will get the user 85% there on the facial tweak which can then have some morph tweaks (new noses, etc) added or they can sculpt on it if they like. I've been LOVING the maya relax polys mode with the sculpting brush to get good geometry distribution. At this point I'm thinking workflow will be for the user to do these tweaks at world center away from their animation and drive the tweaks to the facial rig that attached to the body rig but I'm not sold on that yet. Tomorrow should nothing crazy come up, I'll be working on on an initial pass at hooking up facial poses to controls to start testing things. This is quick down and dirty test as proof of concept to see how the facial feature morphing will work with the actual pose blendshapes. Yes, the shapes need a lot of polish. The generics coming from Face Machine are doing some funky stuff under the lower lip and on the upper as well in the smile. 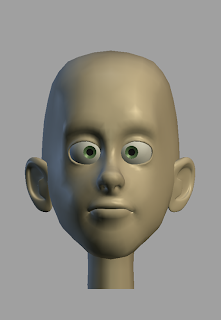 For the most part I'm thinking it's gonna work great and I have plans as to how the user will be able to move the eyes, brow and mouth that I have yet to implement. 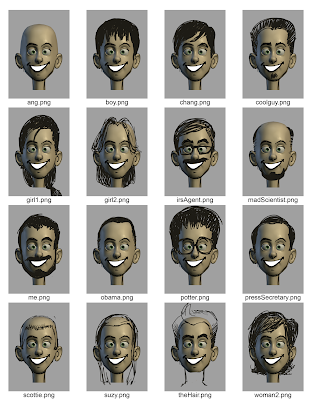 In the above, all are a referenced animated "rig" which I then turned on the whole face morph on the faces on the left and right. So yeah, I messed the snot out of the head playing with planes of the face and what not. There's things I like about the new one and things I don't. The hope is that the customization will be able to get to a wide variety of looks. One issue is for the maximum flexibilty, the base has to be a bit more boring than I'd hoped. Pretty happy with how it's moving aside from the brow. Really prefer the the amount of movement I was getting in the first range of motion I posted last week. Thanks to David Bokser on the feedback and the ideas for how to be able to do a blendshape rig vs a joint based one (which I had been leaning towards). Iris/Pupil variation - played with bout a joint based system and morph based one. Ended up going with the morph based one to make scaling easier and for the customization stuff I was wanting to do. Moving facial features - planning on using a heirarchy of "mover joints" with good natural fall off. Big facial morphs - like in the above vid - I made a "girlish" morph as well as a more "manly" one. I'm trying to think through if it would be better to have a couple of those or go wild and break it down to nose big/small, head variations, etc or if people would prefer just to have a hook up to do their own customizations. Any thoughts would be appreciated. In other news, the bass were hitting the buzz bait like champs on Saturday. Not so much on Sunday. Tracking teeth placement - instead of including teeth in deformed geometry look into rivot type contraint to follow a couple of faces that are fully influence by the jaw. 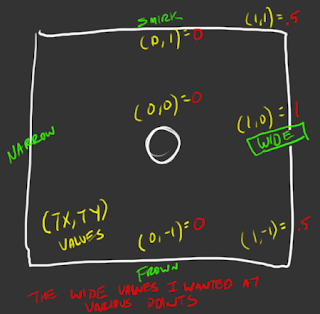 Could potentially create empty groups for folks to put whatever teeth geometry in for replacement. Should eyebrows be apart of deformation mesh....? First up, hailing from Canada - Shaz Lym's Mr fresh! And that's an awesome name Mr. Lym. Almost as cool as my Marine buddy of old - the one and only Cisco Schaff. Man the new Rapunzel Tangled trailer looks perty - check it! So I've been resculpting the face umpteen thousand times over the past few days. I'm finally pretty close to what I want so I'm gonna throw it into Face Machine to see how it's deforming. It's a pretty sweet app for checking a head deformation. Half hour of setup and you can pretty much get any pose you want out of it. Something isn't working well? Well go back and fix the model, rerun the rig maker and you have an updated look at how things are blendshaping up. I'd think about using it for the actual facial rig but 1) it's a bit heavy and 2) users have to have special nodes installed. At first glance, Face Machine is a bit pricey. However for the amount of time it saves me in creating my base set of facial blendshapes I find it well worth the price. I am however, not much a fan of the the cost for their upgrades to new versions of maya. If you're not doing anything more than making the existing plugin work in the new version of Maya just give it to your customers or charge a lot less. It's a bit annoying having to shift back to Maya 2008 to run it. Silo and Zbrush have much more aggreeable upgrade paths. Put in face machine, setup and create the face. 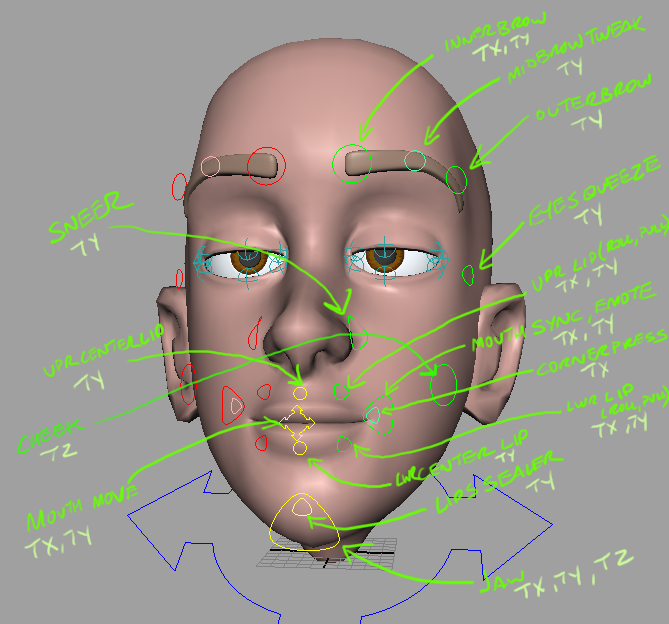 Make a referenced range of motion file on the face to see how things are looking. If I don't like how things are deforming I 1) go back and tweak the model or 2) go to my setup file and move things around if I think it's a pivot issue. 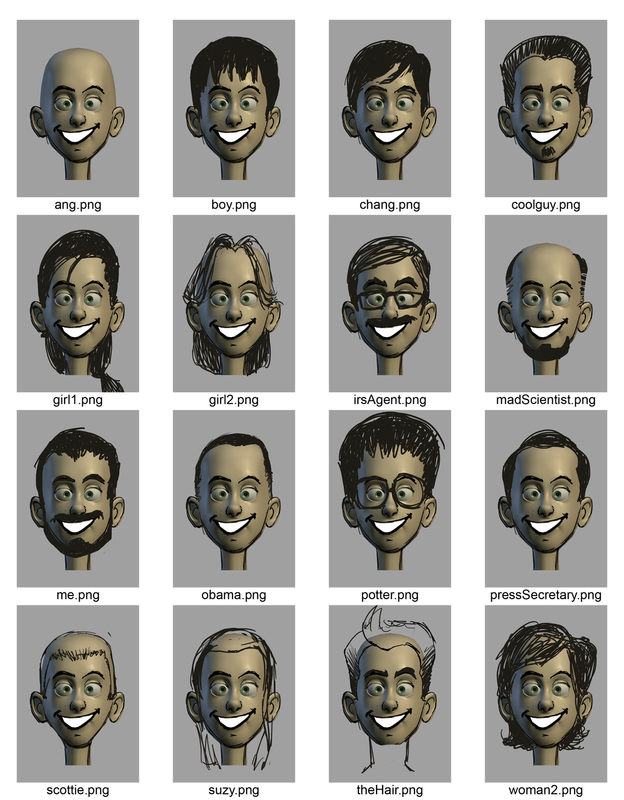 It's been a pretty good workflow over the past few characters I've done. I've actually been really suprised as I was able to use it for Lobstery and Squirrely both and they're not very humanesque. Finished up his hands and legs today. 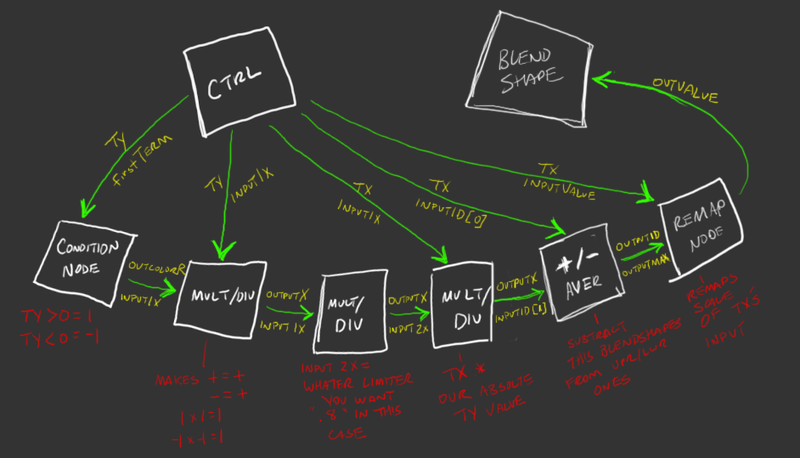 The screen grab on either do the complexity of Jason's methods no justice (much less the coolness) of it. 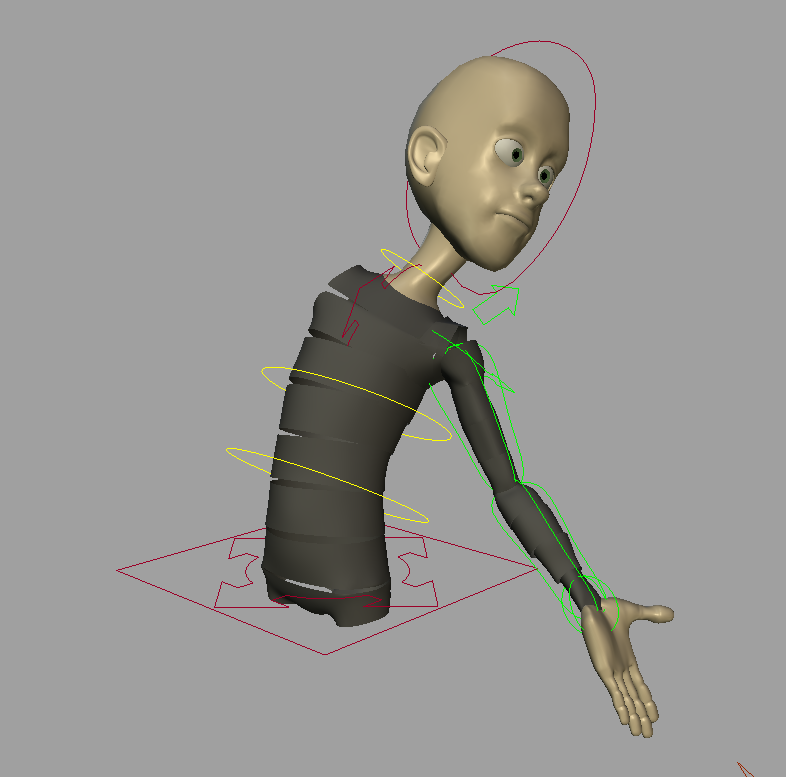 Really love the hand ik usage in the rig for some complex poses. I'm interested to see how he handles fk/ik snapping in the next part (4b). Trying to decide if I should finish the body rig or move back to the face for a bit to give this stuff some time to gel or if it would be better to stay in the learning zone for a bit longer...there's still some of the stuff I'm just following along cause I have no idea what's going on. On to the last part! Just wrapped up part IIIb of Jason Schleifer's fantastic series. Man my head hurts from all the stuff he's been covering. It gonna take doing it multiple times to really have it sink in. However, Morphy is slowly moving towards animate-ability. The head still isn't final but much closer. Gonna finish up the body rig before finaling the head. at the very least I'm gonna have to remodel his lids and mouth for better edgeloops. 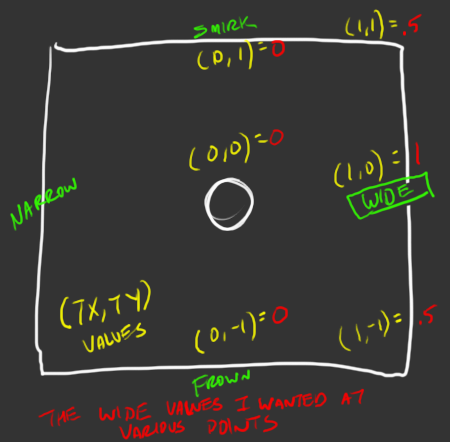 What shape nodes are and how replacing them can do neato things. Yup, 6 years with the app and still a newb. Say, if any modelers out there wanna help out. I'm gonna need some help creating hair styles, glasses, etc for customization. Hope everyone had a great weekend. Had a nice relaxing Monday fishing, hanging with friends, grilling and making some homemade ice cream. Here's a sweet short trailer I ran across this morning on the internets. Love the look.